Definition at line 203 of file llanimationstates.h. Definition at line 208 of file llanimationstates.h. Definition at line 62 of file llanimationstates.cpp. References LLStringTable::addString(), ANIM_AGENT_AFRAID, ANIM_AGENT_AIM_BAZOOKA_R, ANIM_AGENT_AIM_HANDGUN_R, ANIM_AGENT_AIM_RIFLE_R, ANIM_AGENT_ANGRY, ANIM_AGENT_AWAY, ANIM_AGENT_BACKFLIP, ANIM_AGENT_BELLY_LAUGH, ANIM_AGENT_BLOW_KISS, ANIM_AGENT_BORED, ANIM_AGENT_BOW, ANIM_AGENT_BRUSH, ANIM_AGENT_BUSY, ANIM_AGENT_CLAP, ANIM_AGENT_COURTBOW, ANIM_AGENT_CROUCH, ANIM_AGENT_CROUCHWALK, ANIM_AGENT_CRY, ANIM_AGENT_CUSTOMIZE, ANIM_AGENT_CUSTOMIZE_DONE, ANIM_AGENT_DANCE1, ANIM_AGENT_DANCE2, ANIM_AGENT_DANCE3, ANIM_AGENT_DANCE4, ANIM_AGENT_DANCE5, ANIM_AGENT_DANCE6, ANIM_AGENT_DANCE7, ANIM_AGENT_DANCE8, ANIM_AGENT_DEAD, ANIM_AGENT_DRINK, ANIM_AGENT_EMBARRASSED, ANIM_AGENT_EXPRESS_AFRAID, ANIM_AGENT_EXPRESS_ANGER, ANIM_AGENT_EXPRESS_BORED, ANIM_AGENT_EXPRESS_CRY, ANIM_AGENT_EXPRESS_DISDAIN, ANIM_AGENT_EXPRESS_EMBARRASSED, ANIM_AGENT_EXPRESS_FROWN, ANIM_AGENT_EXPRESS_KISS, ANIM_AGENT_EXPRESS_LAUGH, ANIM_AGENT_EXPRESS_OPEN_MOUTH, ANIM_AGENT_EXPRESS_REPULSED, ANIM_AGENT_EXPRESS_SAD, ANIM_AGENT_EXPRESS_SHRUG, ANIM_AGENT_EXPRESS_SMILE, ANIM_AGENT_EXPRESS_SURPRISE, ANIM_AGENT_EXPRESS_TONGUE_OUT, ANIM_AGENT_EXPRESS_TOOTHSMILE, ANIM_AGENT_EXPRESS_WINK, ANIM_AGENT_EXPRESS_WORRY, ANIM_AGENT_FALLDOWN, ANIM_AGENT_FEMALE_WALK, ANIM_AGENT_FINGER_WAG, ANIM_AGENT_FIST_PUMP, ANIM_AGENT_FLY, ANIM_AGENT_FLYSLOW, ANIM_AGENT_HELLO, ANIM_AGENT_HOLD_BAZOOKA_R, ANIM_AGENT_HOLD_HANDGUN_R, ANIM_AGENT_HOLD_RIFLE_R, ANIM_AGENT_HOLD_THROW_R, ANIM_AGENT_HOVER, ANIM_AGENT_HOVER_DOWN, ANIM_AGENT_HOVER_UP, ANIM_AGENT_IMPATIENT, ANIM_AGENT_JUMP, ANIM_AGENT_JUMP_FOR_JOY, ANIM_AGENT_KISS_MY_BUTT, ANIM_AGENT_LAND, ANIM_AGENT_LAUGH_SHORT, ANIM_AGENT_MEDIUM_LAND, ANIM_AGENT_MOTORCYCLE_SIT, ANIM_AGENT_MUSCLE_BEACH, ANIM_AGENT_NO, ANIM_AGENT_NO_UNHAPPY, ANIM_AGENT_NYAH_NYAH, ANIM_AGENT_ONETWO_PUNCH, ANIM_AGENT_PEACE, ANIM_AGENT_POINT_ME, ANIM_AGENT_POINT_YOU, ANIM_AGENT_PRE_JUMP, ANIM_AGENT_PUNCH_LEFT, ANIM_AGENT_PUNCH_RIGHT, ANIM_AGENT_REPULSED, ANIM_AGENT_ROUNDHOUSE_KICK, ANIM_AGENT_RPS_COUNTDOWN, ANIM_AGENT_RPS_PAPER, ANIM_AGENT_RPS_ROCK, ANIM_AGENT_RPS_SCISSORS, ANIM_AGENT_RUN, ANIM_AGENT_SAD, ANIM_AGENT_SALUTE, ANIM_AGENT_SHOOT_BOW_L, ANIM_AGENT_SHOUT, ANIM_AGENT_SHRUG, ANIM_AGENT_SIT, ANIM_AGENT_SIT_FEMALE, ANIM_AGENT_SIT_GENERIC, ANIM_AGENT_SIT_GROUND, ANIM_AGENT_SIT_GROUND_CONSTRAINED, ANIM_AGENT_SIT_TO_STAND, ANIM_AGENT_SLEEP, ANIM_AGENT_SMOKE_IDLE, ANIM_AGENT_SMOKE_INHALE, ANIM_AGENT_SMOKE_THROW_DOWN, ANIM_AGENT_SNAPSHOT, ANIM_AGENT_STAND, ANIM_AGENT_STAND_1, ANIM_AGENT_STAND_2, ANIM_AGENT_STAND_3, ANIM_AGENT_STRETCH, ANIM_AGENT_STRIDE, ANIM_AGENT_SURF, ANIM_AGENT_SURPRISE, ANIM_AGENT_SWORD_STRIKE, ANIM_AGENT_TALK, ANIM_AGENT_TANTRUM, ANIM_AGENT_THROW_R, ANIM_AGENT_TRYON_SHIRT, ANIM_AGENT_TURNLEFT, ANIM_AGENT_TURNRIGHT, ANIM_AGENT_TYPE, ANIM_AGENT_WALK, ANIM_AGENT_WHISPER, ANIM_AGENT_WHISTLE, ANIM_AGENT_WINK, ANIM_AGENT_WINK_HOLLYWOOD, ANIM_AGENT_WORRY, ANIM_AGENT_YES, ANIM_AGENT_YES_HAPPY, ANIM_AGENT_YOGA_FLOAT, mAnimMap, and mAnimStringTable. Definition at line 206 of file llanimationstates.cpp. Definition at line 213 of file llanimationstates.cpp. References LLUUID::isNull(), mAnimMap, and NULL. Referenced by LLMotionController::createMotion(), and LLKeyframeMotion::setEmote(). Definition at line 231 of file llanimationstates.cpp. 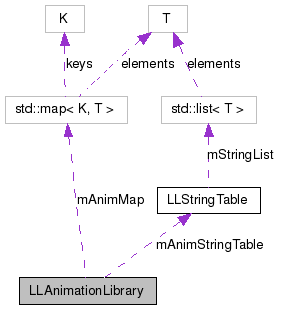 References LLStringTable::checkString(), FALSE, mAnimMap, mAnimStringTable, and LLStringBase< char >::toLower(). Referenced by LLViewerGesture::doTrigger(), LLKeyframeMotionParam::loadMotions(), and LLKeyframeMotion::onActivate(). Definition at line 209 of file llanimationstates.h. Referenced by animStateToString(), LLAnimationLibrary(), and stringToAnimState(). Definition at line 206 of file llanimationstates.h. Referenced by LLAnimationLibrary(), and stringToAnimState().